Three Pass Wet Back Design Obviates Need For Refractory Work, Prevents Thermal Stresses On Rear Tube Plate And Achieves Maximum Thermal Efficiency. Compact And Sturdy Design With Less Space Requirement. Better Steam Quality With 0.985 Dryness Fraction Achievable. 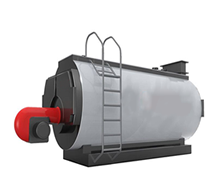 Well Judged Burner And Boiler Combination Maximises Overall Performance Of The Boiler. Energy Efficient And Environment Friendly Burner With Excellent Fuel Management And Minimum Excess Air For Complete Combustion And Low Air Pollution Level.